Your team uses Slack for productivity and collaboration. Why not increase their productivity by enabling them access their shared calendar (Google Calendar in this case) right from the Slack channel? The custom Slack - Google Calendar integration helps your team lookup, add, update calendar events and share their schedule with each other without having to open the Calendar application separately. 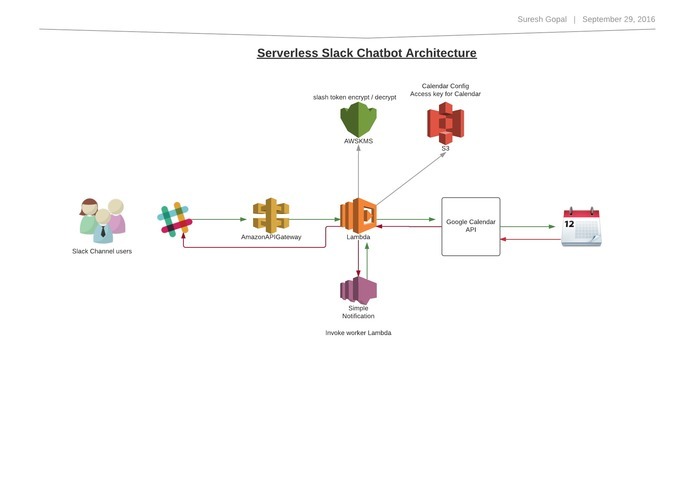 The integration leverages slashcommand feature of slack by integrating it with AWS Serverless backend. Integration of distinct services (Slack & Google Calendar) in a secure and efficient manner using a true serverless architecture.